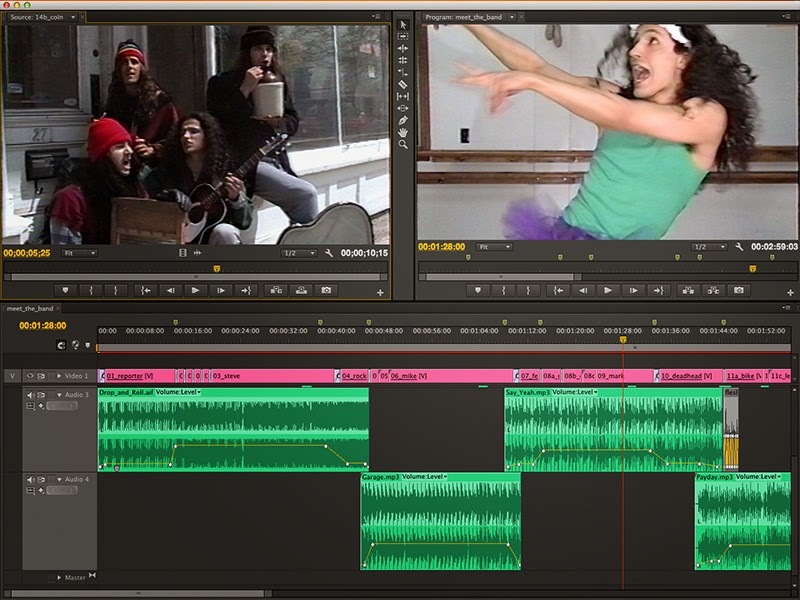 Editing the "Flesh: Meet the Band" video. Last week in Real Workflows - Flesh: Meet the Band (Pt 1), we discussed rebuilding a video for the band Flesh, by eye-matching the source clips to the original edit. Why go through all this trouble you ask? Unfortunately, the original video used a piece of copyrighted music, and I couldn't post it publicly until that music was removed. The original edited video did not include split audio tracks, so I had to go back to the original source for the rebuild. I decided to upscale the video to 720p at the same time. I knew that I would be passing every source clip through Adobe After Effects, so I decided I would use Adobe Premiere Pro for my edit. Most of the time, I prefer using Avid Media Composer, but for this project, Adobe Premiere Pro worked best for my workflow. As I wrote in "What is the Best Video NLE Out There? ", the best system is the one that works best for the workflow of your current project. For the person-on-the-street interviews, all the chroma was removed and a scan-line look was achieved by adding a partially transparent black layer with a venetian blind effect on it. 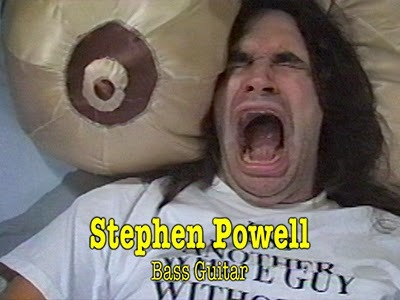 The first band member in the video was the bassist Stephen Powell. For this scene, we built the set in the West Acton apartment I was renting at the time. We concentrated all of the debris along the path the camera would travel. This sequence was a very low-tech hand-held tracking shot that was achieved by having two camera operators. Half way through the shot, the camera is handed off from one camera operator to the next. The ambient sound recorded by the camera included all the vocal instructions that the operators were giving each other and the cues given to Stephen as the camera approaches his face. For that reason, none of the ambient sound at the time of the shoot was usable. The sounds such as the scratch and yawn were done in post production. Adobe After Effects timeline with a HOLD keyframe on Time Remapping. Using the Adobe Premiere Pro / After Effects workflow also allowed me to take advantage of the very elegant Time Remapping feature in After Effects to create the freeze frame for the lower third. As I've mentioned in the past, Motion Effects in the Avid Editing System, aren't as intuitive as in Adobe After Effects. In After Effects I just create a HOLD keyframe on whatever frame I want to freeze. 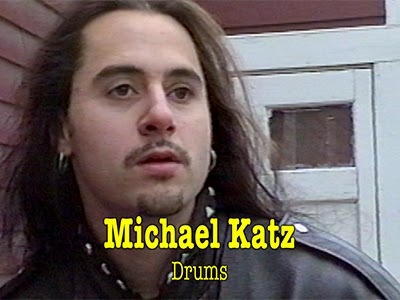 The second band member to be introduced in the video was drummer Michael Katz. This scene was shot in downtown West Acton, MA, where I was living at the time. For Michael's section, no other sounds other than the nat sounds recorded by the camera were required. For Michael's lower third, the 4x3 source needed to be shifted up so that his head wasn't cropped by the 16x9 frame. In fact, there were a lot of shots that decisions were made regarding framing in their new 16x9 frame. Next week in "Real Workflows - Flesh: Meet the Band (Pt 3)", we'll discuss some of the music decisions that were made when restoring the Flesh: Meet the Band video.